When Do We Stop Working for SARS This Year? Companies: “XBRL” is Coming Soon. What is it and Are You Affected? Amazon is now regarded as the best company in the world – its market capitalisation is approaching R800 billion and its founder Jeff Bezos is the world’s richest man. Year after year in customer satisfaction surveys Amazon invariably comes out on top. Jeff Bezos recently shared Amazon’s secrets in his annual letter to shareholders. The key to this success is that high standards are now part of the culture of Amazon. How was this achieved? High standards are not part of our DNA but anybody willing to learn can absorb the requirements of high standards. This is refreshing in an era where many organisations are recruiting only well qualified people. Once the ethos of high standards is taught and accepted it becomes infectious and spreads to the whole team and the organisation. Conversely, the opposite is true that low standards are also infectious. Your business will not be successful unless all disciplines achieve high standards. 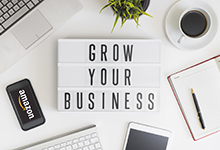 If, for example, you have great marketing and production capabilities but poor distribution and sales staff the business will struggle to be competitive. Bezos says all people have blind spots and cannot set high standards in all areas. But if you build up a strong management team which covers all spheres of the business, you will achieve best practice methodologies across the company. Communicate to your staff that attaining world class standards involves hard work. It is not going to be easy but if there is a culture of team members striving to achieve these standards, then it will filter down to all employees. No individual has all the skills required to complete all functions in their team activities. But working in teams most often means that one team member will have a unique, necessary skill needed by the team. In other words, having a pool of skills in a team increases the overall skill levels of the team. Most surprising is that Amazon doesn’t work in PowerPoint presentations but in six page memos. At the beginning of each meeting one team will present a six page memo. The meeting will spend half an hour reading and discussing the memo. This has many benefits – the team writing the memo spends time getting their thoughts and ideas into a well-constructed narrative format. As Bezos writes, you cannot lay down procedures on how to write a good memo but everyone recognises a good memo when they see it. The power of this is that everyone in the team discusses and understands these memos. In turn it is well communicated to the organisation and thus builds up Amazon’s high standards. Not everyone can write a high quality memo, but there is always someone in the team who can and if each team member contributes to it, then the team as a unit will have the skills to write a high quality memo. Bezos says we need to accept that a high quality memo usually cannot be written in a couple of weeks – Amazon’s best memos are often written and rewritten over a few months until they achieve the high standard and clarity required. This needs to be communicated to the organisation, otherwise teams will quit if they can’t write a good memo in a week or two. As Bezos writes above, be realistic. Once you have achieved this across the organisation, your business will have world class products/services, people and processes. In a world of fast moving consumer expectations and rapid change, building a strong organisation with high standards is critical to staying competitive. You also find that high calibre people are drawn to companies like Amazon. This reinforces the success of the company and enables it to keep pulling away from the competition. We live in a dynamic world so we need to keep growing our knowledge and skills. Some of us may not like the idea of using memos to build standards but good leadership, fostering a culture of learning (standards are learnt), quality in all aspects of the business and encouraging teamwork will put your business on the path of success. 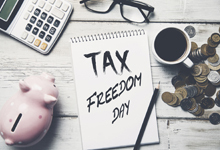 It has become a global phenomenon measuring Tax Freedom Day, the day up to which you work to pay your taxes – only after Tax Freedom Day do you start working for yourself. In 2018 it takes us South Africans 133 days or 39% of our working time to pay our taxes. Generally, the trend has been rising – when the measurement began in 1994, it took 101 days to pay our tax. We have gone up by more than one month since then, which is quite a disturbing trend. This is set to continue as Government will take a few years to get its fiscal house in order. However, when we benchmark South Africa against other countries, we are not doing too badly. 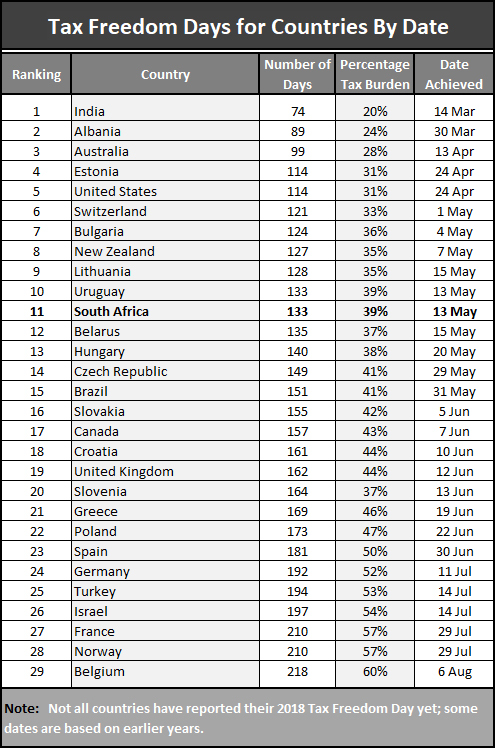 As reflected in the table below, we are placed 11th out of 29 countries. Source: the above table is adapted from Wikipedia. By the time you read this article, you will have paid your tax and for the rest of the year the money you earn is all yours! We are all aware that business, as with life, is full of risks and things go wrong from time to time. Some of us shy away from planning for these risks, put off by complex methodologies such as the Risk Matrix, and say “this is not for me”. Why not just write down what can go wrong – you can do it alone or with your team. As you are experienced in business, you have plenty of knowledge of the hazards out there. Once you have a list, then ask yourself, what is the likelihood of the event happening? If it is very low and the outcome of the event occurring will have a small effect on your business, move on to the next risk. Some risks will have a substantial impact on your business and it may be difficult to come up with a strategy to counter this risk. Speak to experts in the field, then approach the risk from different angles until a solution appears. Eventually, you will have a series of strategies that could save your business one day. Most of the risks and the solutions you identify will be things you will probably have already thought through. But there will always be one or two you haven’t thought of and that is the power and benefit of this exercise. For those who don’t like to dwell on what they call the negative, this exercise is actually a positive experience. 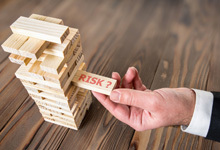 Assessing what can go wrong and having a strategy to counter the risk will allow you to have the comfort of knowing you will be ready to react to adverse events when they occur. Also, confronting your fears is never easy but by considering all possible angles and finding a solution you are in fact overcoming these fears. As they say, don’t meet your fears head on but tilt at them until you feel comfortable. The unpredictable is happening more and more – who would have predicted Donald Trump becoming President? So engage in lateral thinking when you do this process. You also need to factor in how other people will react – very few economists, for example, factored in the complete panic that set in during the 2008 financial meltdown. Thus, many had the strategy of selling down their holdings should financial cracks begin to appear, but in the avalanche of sell orders, they couldn’t offload their holdings and took substantial losses. Just remember that all high-risk-takers survive because they consider all the risks and make plans to counter them. Have a look also at these excellent TED Talks videos “Three Simple, Fun and Effective Tools to Help Manage Risk | Will Gadd | TEDxYYC” and “Risk Management: Chris Davenport at TEDxMileHigh”. 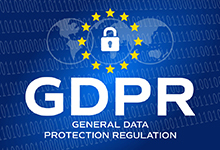 The EU’s General Data Protection Regulation (GDPR) became enforceable on the 25th of May. It is regarded as the world’s most comprehensive legislation protecting private data. GDPR may be applicable to South Africans if your business provides goods or services in the EU, and in certain other circumstances. 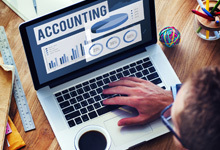 Speak to your accountant if in doubt – there are hefty penalties for non-compliance. As you know, South Africa’s own privacy law POPI (the Protection of Personal Information Act) is expected to commence any day now, and that’s when the one year grace period clock will start ticking. Judging by the extensive media coverage given to GDPR last week, POPI will have a substantial impact in South Africa. Although the one year grace period will give you a year before enforcement kicks in, if you haven’t already started getting ready for POPI, speak to your accountant about it and watch this space - we’ll compile a checklist on how POPI will affect you once POPI commences. The Companies and Intellectual Property Commission (CIPC) will from 1 July 2018 require that all Annual Financial Statements (AFS) submitted to the CIPC be in eXtensible Business Reporting Language (XBRL) format. What is XBRL and what are its benefits? It is a global standard for digital reporting. It uses a tagging software system whereby data can be used across many platforms without needing to recapture it. This means it saves time, is more accurate and can be used as an analytic tool. For example, CIPC will be able to meaningfully compare AFS from different organisations which will be of value to users such as investors. In addition, XBRL quickly identifies submission problems (making them quick to correct) and is extremely cost effective. 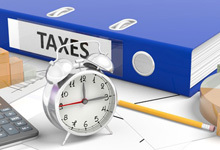 It is widely used overseas – for example, people submit their income tax returns in the UK using XBRL. Who has to submit annual financials to CIPC? Any company whose public interest score is at least 100 and compiles its AFS in-house. If you fall into one of these categories speak to your accountant who will guide you through the process of creating your AFS in XBRL. Remember the implementation date is 1 July this year. There are only run-of-the-mill deadlines this month. It is worth getting your filing and workpapers ready for your 2018 tax return as filing season opens in July. Be alert to yet more scams involving SARS, such as fraudulent emails which say you owe interest to SARS and give an incorrect bank account to pay in the amounts “owed”. If in doubt speak to your accountant or contact SARS.